So everyone complains about their boss sometimes, but some situations rise to monstrous proportions! Everyone has a bad day now and again, but a true Boss-zilla is a monster all the time! Wondering if your boss might qualify? Breathing fire and stomping cubicles can reveal Boss-zilla's true face, but those aren't the only signs. 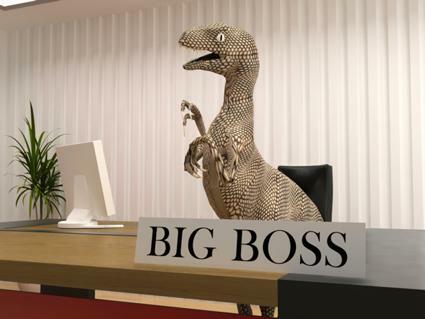 Let us help you figure out if you just might be working for a real Boss-zilla! Do you have a sneaking suspicion that your supervisor just might be a Boss-zilla? Here are some of the signs! Everyone has good moods and bad moods, but your boss goes beyond your basic mood swings to full-on completely different personalities - and there's no telling which one will show up on any given day. One day, he's your best friend (let's do lunch!) and the other he hates everything about you - from the fact that you're only five minutes early (why are you so late?!!?) to the way you sit in your chair (were you raised in a barn???). If you have a super-moody boss, you wake up wondering which personality you'll deal with today. You don't know if Dr. Jekyll or Mr. Hyde will show up on any given day - or, really, from one minute to the next. If you hear, "Which one of you idiots did this?" screamed down the hallway one minute, only to come back from lunch to a bouquet of balloons and a cake touting your work group as "the best team ever," your supervisor is definitely a Boss-zilla with a mood swing problem! It's hard to know where you stand when your boss breathes fire one second and spews hearts and flowers the next! It's not you. It's him. Really. He's a real monster (Boss-zilla, to be specific). A manipulative Boss-zilla will go out of her way to stab you - and everyone else - in the back. This "special" kind of boss who will go out of her way to try to make herself look good - and if she steps on someone else on her way to the top, all the better for her! Her main goal is to build herself up, and her method involves keeping you (and everyone else!) down. This particular breed of Boss-zilla will lie, cheat, steal, and do virtually anything else that suits her purposes, all in the name of capturing the attention of the C-suite executives and looking like a singular superstar. 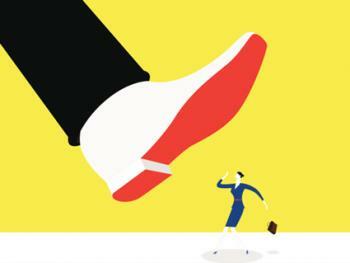 If your boss is a master manipulator, she just might get her kicks out of playing you and your co-workers against one another, claiming, of course, that it's all in the name of motivating the team. Yeah, right. And, if something goes wrong, rather than owning the problem since she's in charge, she'll deflect blame. Will someone get her some competent people, please? Let something go right, though, and she'll take all the credit. She accomplished her greatness in spite of you, not because you, don't you know? If you have a great idea, she'll let you know why it just won't work, maybe even making you question your sanity for suggesting it. Meanwhile, she's plotting to pitch it to the big boss and keep the credit for herself. 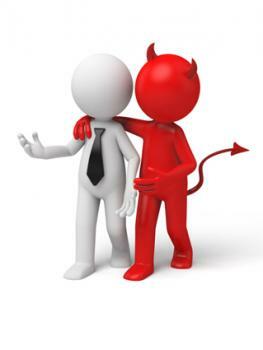 Don't fall victim to the manipulations of this especially toxic breed of Boss-zilla. Karma will catch up with her soon enough. You don't have to have a Ph.D. in psychology to recognize a workplace sociopath when one crosses your path, and having one as a supervisor is a super-special (not!) experience. If your boss thinks you shouldn't let anything interfere with work - from your own major illness to the death of a family member - that's a sign that he just might be anti-social enough to qualify as this particularly toxic Boss-zilla breed. He has no life outside the workplace and finds the concept of work-life balance to be just silly. "Stay home?" he says, absolutely shocked. "What is wrong with you? What kind of person let a little fever (103!) keep her down? Contagious? Only to a bunch of wimps! Your leg is broken? You don't need it to write sales proposals! Your dog died? So what? Buy another one! Sell, sell sell. Type, type type. Work is what matters in life!" 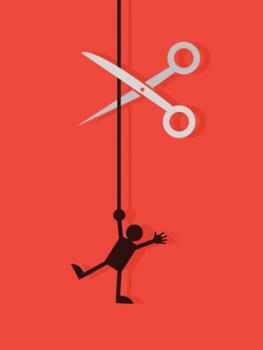 Unfortunately, the very things that make your boss a sociopath - ruthlessness, a single-minded drive and a lack of empathy - just might be the traits that helped him get promoted to a supervisory role in the first place. It all depends on who made the decision. This personality type is all-too-common in the modern workplace, so don't be surprised to experience the wrath of a single-minded sociopath at some point in your career. Don't try to talk to a sociopathic Boss-zilla about how you feel. Seriously. He doesn't care, and he'll think you're weak for trying. Find someone who does - ideally a new boss at a better job! Does your boss constantly remind you that there are plenty of other people out there who would just love to have your job? This brand of Boss-zilla comes from a planet where people work harder when they live in the constant fear of losing their job. "You don't want to work four weekends in a row? I'll remember that the next time I get a resume from someone who would actually appreciate this job! If you can't do what I want, I'll find someone who will! Widget-makers like you are a dime a dozen! Nobody is irreplaceable. I could snap my fingers and find five more better than you!" If you hear some version of these threats from your supervisor, you're definitely working for a fear-inducer! "I wouldn't get too comfortable here," a fear-inducer might stay. "I only want winners on my team," is another technique she might use to encourage you to feel like your job is in jeopardy. The implication, of course, is that you are a loser. (Think again - there's only one real loser on this team - and it's not you!) There are plenty of not-so-subtle signs that a fear-inducer is on the rampage in your department. Basically, if you feel like you're just holding on to your job by a thread more often than not, there's your sign. You're working for a toxic fear-inducer. Think about it. If you're so bad, why hasn't she pulled the plug already? It might be time to let her do what she's always threatening you with! Find another job, then quit! And really mean it when you say it. Is your boss a member of what she sees as "generation perfect?" In other words, did her age group invent sliced bread, electricity, and the automobile while establishing world peace (seriously? ), while everyone of a different age group is pretty much useless (in her eyes)? Does she label you as a Millennial who can't possibly understand hard work or does she refer to you as "Generation Why Not?" if you're in Gen Y? This boss will tell you, "In my day, I knew better than to expect anyone to ask me what I thought until I had at least ten years of experience! 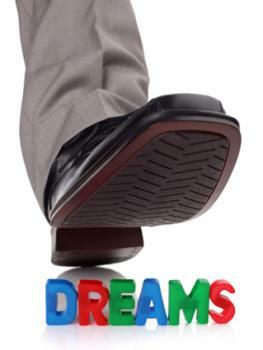 I'll listen to your ideas when you've paid your dues! When you've been here as long as I have, you'll understand - and you'll thank me!" She may even ask, "Just who do you think you are?" and - gasp! - expect you to respect her just because of her job title, even though she is judgmental and nasty. When you accomplish something great - even against the odds of your unfortunate decade of birth - she'll probably say that it's all because of your superstar mentor (her, of course!). And, if she'd only been lucky enough at your age to have a mentor like her, she'd be queen of the world by now! Little does 'gen perfect' Boss-zilla know, you're plotting your exit now! You'll be somewhere else - where you are valued for what you have to contribute now - long before she figures out that you're worth listening to! Of course, these aren't the only types of Boss-zilla supervisors stomping their way around the modern workplace. Unfortunately, hances are that you'll encounter more of a few of them throughout your career - along with some others that are equally bad, or even worse. When you cross the path of one of these monster bosses, it's up to you to decide how to let it impact your work life. You may love your job so much that dealing with Boss-zilla is a small price to pay. But, you just might be in a situation that you're better off leaving. Not everyone who rises to the level of 'boss' decides to add '-zilla' to the title, so don't assume that you're destined to the same experience no matter where you are working. Ultimately, the decision on what to do is up to you. A word of advice, though - don't think that you have to mimic your boss's bad behavior to get ahead in your career. Nasty workplace behaviors eventually catch up with everyone. Become a great employee in spite of having a boss with behavior issues rather than picking up her bad habits. That's the best revenge of all.